During the Central Middle Ages Catholics had the opportunity to take part in Holy War in the Latin East in two different but related ways, by taking the Cross and by entering the Order of the Temple. Both crusaders and Knights Templar were dubbed by contemporary panegyrists milites Christi, knights engaged in combat for the cause of Christ. On numerous battlefields in the Middle East crusaders and Templars fought side by side. By the late thirteenth century both modes of Holy War faced critical situations. Crusading failed to save the mainland states of Palestine and Syria from Muslim conquest in 1291, while the Knights Templar entered a period of internal demoralisation and external attack that culminated in the suppression of their Order in 1312. This collection of essays by distinguished historians of the Crusades and the Order of the Temple covers the whole span of their historical evolution and offers numerous insights into the ideologies, practicalities and ramifications of Christian Holy War in the Middle Ages. Contents: Preface; Malcolm Barber: an appreciation, Anne Curry; Bibliography of works by Malcolm Barber 1970-2005, Judi Upton-Ward; Part I The Crusades: Byzantium in western chronicles before the First Crusade, John France; Knowing the enemy: Latin relations with Islam at the time of the First Crusade, Thomas S. Asbridge; Kingship, identity and name-giving in the family of Baldwin of Bourcq, Alan V. Murray; Armenia, Edessa and the Second Crusade, Jonathan Phillips; The admirable enemy? Saladin and Saphadin in Ambroise's Estoire de la Guerre Sainte, Marianne J. Ailes; Baldwin of Flanders and Henry of Hainault as military commanders in the Latin Empire of Constantinople, Peter Noble; A female physician on the Fourth Crusade? 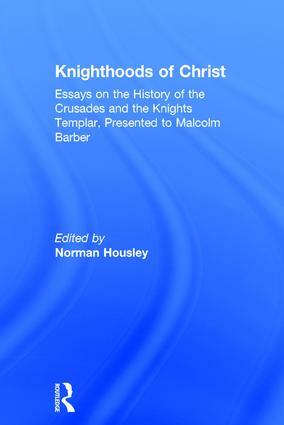 Laurette de Saint-Valéry, Susan B. Edgington; Mounted warrior saints in crusader icons: images of the Knighthoods of Christ, Jaroslav Folda; 'The common corps of christendom': Thomas More and the crusading cause, Norman Housley. Part II The Knights Templar: Belchite, le Temple et Montjoie : la couronne d'Aragon et le Temple au XIIe siècle, Alain Demurger; The Military Orders and the East, 1149-1291, Jonathan Riley-Smith; The old French William of Tyre and the origins of the Templars, Peter W. Edbury; The growth of the Order of the Temple in the northern area of the kingdom of Valencia at the close of the 13th century: a puzzling development?, Luis GarcÃ­a-Guijarro; The career of a Templar: Peter of St Just, Alan Forey; Relations between houses of the Order of the Temple in Britain and their local communities, as indicated during the trial of the Templars, 1307-12, Helen J. Nicholson; Italian Templar trials: truth or falsehood?, Anne Gilmour-Bryson; The last Master of the Temple: James of Molay, Sophia Menache; Index. Norman Housley is Professor of Medieval History and Head of the School of Historical Studies at the University of Leicester, UK.